We offer a wide range of Air Tray Dryers (ATD), which is fabricated from superior quality of raw materials in compliance with the set industry quality standards. The product range is widely used in industries like Chemical, Textile, Pharmaceutical, Automobiles, Food, Dyestuff and other industries. Our customer can avail the product from us at comparable prices. The tray dryers are heated by means of electrical, steam or oil/ gas fired burners. Promas™ dryers are specially designed to have better efficiency than any other dryers available from other tray dryer manufacturers. The dryer cabinet is designed in such a way that the airflow inside the dryer has minimum resistance. Internal surfaces of the dryer are made with well-rounded corners with the maximum angle so as to offer the least resistance to airflow, resulting in less pressure drop across the corners. The outer body is also fabricated with rounded edges without steps from outside to have the smooth finish. The inside fan & radiator/heaters are covered with SS / Gl mesh to have safety in operation. 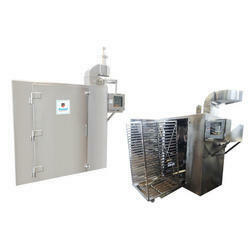 The drying oven model having MS body from outside & SS body inside is provided with 150 mm SS collar around the door. The shafts of circulation fan, the inlets & outlets of the radiator coil are sealed by food grade sealing pads which stop the leakage of hot air from the drying cabinet. Leakages increase drying time of the product inside the trays of the dryer & in some cases cause the air contamination of air inside the dryer. Thus sealing helps to save the energy of drying process. The inlet (suction) of the dryer is provided with 10-micron filter to avoid air contamination. The exhaust of the dryer is provided with either manual or motorized operated the damper and can be operated precisely for various positions of the damper from the main control panel board. The outer body is also polished to 180-220 grit finish with step-less body GMP model tray dryers. Economy models of Tray Dryer the inside SS sheets are of 18-swg. AISI 304/316, tag welded & mirror finished, while for the GMP models the inside of the dryers are made of either 14-16 swg thick sheet fully welded from inside and polished to mirror finish. AISI304 inside or AISI316 on the outside. AISI 316 on both inside and outside. AISI 304orAISI 316 inside and M.S out side. Sheet thickness as per customers' specifications. The doors of the dyers are provided with groove & with hollow "D" shaped food grade Silicon Neoprene gasket to have leakage proof door. The locks are either ball catch or bolt type lock arrangement. All the dryers are provided with necessary control panel boards. The dyers are supplied with either FLP or NON-FLP controls & drives. Looking for Air Tray Dryers ?